The below map highlights the counties with the best budgeters. This study takes into account consumer expenditures as a percent of personal income, net wealth as a percent of personal income and bankruptcies per 1,000 people. Scroll below to view the results of our data analysis, as well as the methodology for the study. 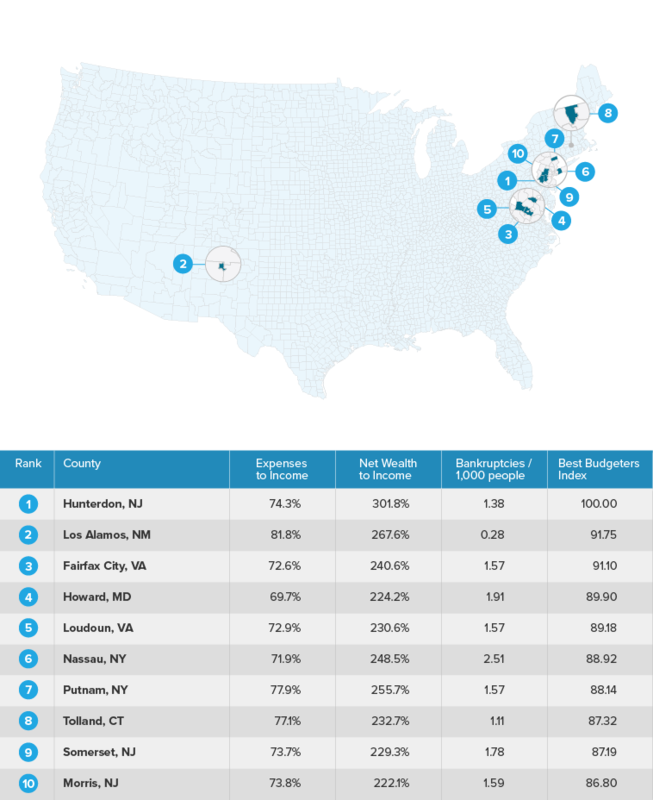 Where do the best budgeters live? To answer this question, we looked at three factors: how much people spend as a percent of personal income, average net wealth as a percent of personal income and bankruptcies per 1,000 people. We first determined the amount of money that people spend as a percentage of their income. To do this, we took the average personal consumption expenditures of each county and divided that by the average per capita income for people living in those counties. This represents the percent of personal income that goes towards personal expenses. Next, we looked at net wealth as a percent of personal income. This incorporates a view of the income level of the people within a county relative to their net worth. We divided the average net wealth of a person in each county by the average per capita income. To calculate bankruptcies per 1,000 people, we divided total bankruptcies declared in one year by the people living in each county. We then multiplied that number by 1,000. Finally, we indexed and equally weighted the three factors to yield our best budgeters score for each county. We then indexed those scores so the county with the best budgeters gets a 100.